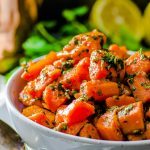 A great side-dish that takes minutes to prepare, our Moroccan carrot salad has a beautiful presentation and it can be served with a casual supper or formal holiday meals. 2 tablespoons of sea salt may seem like a lot, but all doesn’t get absorbed into the carrots. It is important to salt the water well, the same way you do when cooking pasta. For us, 1/3 cup of lemon juice is the perfect amount for this Moroccan carrot salad. You can reduce the amount of lemon if you prefer. Carrots should be soft, but they should still hold their shape. The carrot salad tastes better when prepared a day or two ahead of time. You can find Sumac online or in Whole Foods. If you don’t have it handy, just skip it. But we highly recommend you add it to your pantry.